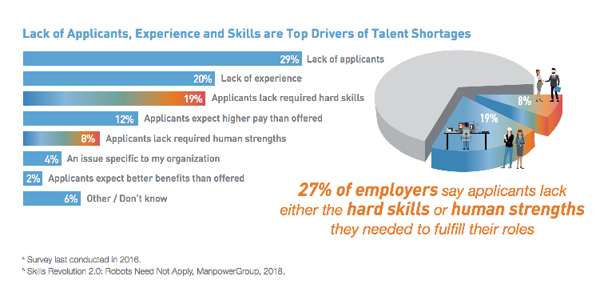 Employers worldwide are facing the most acute talent shortage since 2006, according to the latest ManpowerGroup Talent Shortage Survey. Of the nearly 40,000 employers surveyed, 45 percent are struggling to fill roles. Skilled trade workers, sales representatives, and engineers are the most difficult to find. Employers in Japan (89 percent), Romania (81 percent), and Taiwan (78 percent) report the most difficulty filling positions as populations age, skills needs shift, and organizations struggle to find the right blend of technical skills and personal strengths. In today's Skills Revolution, where new skills emerge as fast as others become obsolete, 27 percent of employers say applicants lack either hard or soft skills. Employers place greater importance on transferable soft skills as roles adapt; more than half say communication skills—written and verbal—are their most valued soft skills, followed by collaboration and problem solving. Build. Invest in learning and development to grow the talent pipeline and upskill the existing and potential workforce. Buy. In a tight labor market, go to the external market to find the best talent that cannot be built in-house in the time required to fill immediate openings. Borrow. Cultivate communities of talent inside and outside the organization, including part-time, freelance, contract, and temporary workers to complement the existing workforce. Bridge. Help people move on and move up to new roles inside or outside the organization.